I dropped my daypack on the bus and immediately turned around. 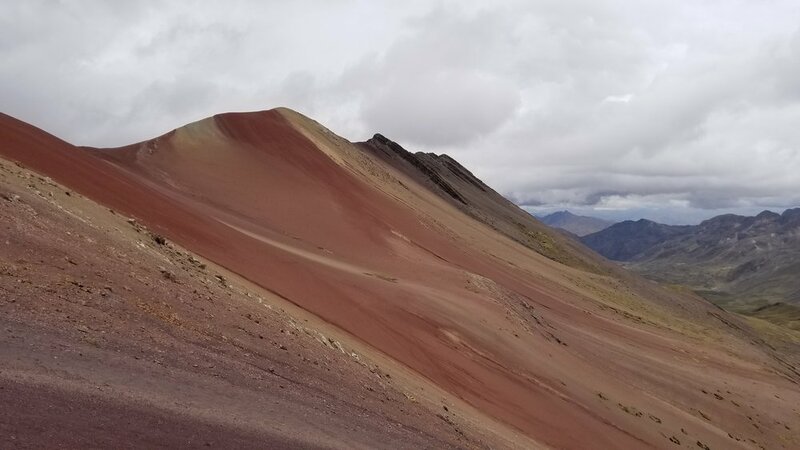 Beyond the wooden sign that read “Welcome to Vinicunca, Rainbow Mountain,” my eyes scanned the closest ridgetop for the group I had passed on my descent from the 17,060 ft peak of Peru’s newest famed tourist destination. As my eyes passed over the ruddy cliffs that lined the trail to the mountain’s summit, I could hear the hail that had started ten minutes before falling on the bus’s aluminum roof. It took maybe five minutes before I saw them, slowly making their way down the hill. It was a group of ten, carrying a middle-aged women supine on a stretcher down the dirt and boulder trail that winds its way from the peak of the mountain to the parking lot where I was sitting. She had fallen victim to the altitude. I had asked if they needed help when I passed them thirty minutes before, but the nurse and medic from the tour company already attending the patient had said that it wasn’t necessary. However, now, as my eyes connected with the slow-moving pack, it became apparent that some of the stretcher bearers were becoming tired. I climbed out of the bus and began my second ascent, trying my best not to run and compromise my own health. I reached the group and called out in my best Spanish “algún persona está cansado?” One of the men in back, his face contorted with stress, and gripping his corner of the stretcher with both hands motioned for my assistance. As the weight of the stretcher fell into my hand, the patient’s face came into my view. The rest of her was covered by jackets and blankets in an attempt to prevent hypothermia. It was a face I had seen before while working on ambulances and in hospitals, obscured by an oxygen mask, but with eyes that were very much exposed. In those eyes I could feel the panic and fear that raced through the woman’s mind as ten strangers rushed her down the side of a mountain two and a half hours away from the nearest hospital. The nurse, for anonimity's sake, we'll call her Javi, bent down to comfort her, and I shifted my gaze forward to the parking lot. The buses shimmered in the distance like a herd of metallic beasts, foreign creatures that had only recently arrived in this land to join the herds of alpaca, llama, and sheep that already inhabited the mountain. Curious animals paused their grazing and stared up at us as we passed. I squatted as I walked because fully extended, my relatively long European legs would tilt the woman off the stretcher. Only one kilometer left. We reached the parking lot and after a brief period of deliberation the nurse instructed us to place the patient in minivan. The seats had been adjusted for the stretcher, but it was still a struggle to fit the patient, the nurse, a medic, a driver, and the patient’s family all inside. It was far different than the easy to load stretchers and ambulance doors that I had become accustomed to in the United States, but it worked. And in remote settings such as these, improvision is less a beneficial skill, and more an absolute necessity. After obtaining a set of vitals on the woman they were ready to go. I did my best to clear the crowd that had formed from around the van so that they could depart. Javi signaled for me to close the door and the vans multi-hour trip back to Cusco began as the van began its decent down the winding dirt road full of switchbacks and newly formed puddles. I made my way back to the bus that had carried me and my tour group to the mountain that morning. Although I had been one of the first five to arrive back at the parking lot in the time since I had deposited my things in my seat, the bus had become full. It now housed the majority of my tour group. Shuffling and climbing over bags and appendages in the tightly packed vehicle, I found my seat, which I fit into snugly like a puzzle-piece. My legs, always far too long for everything here, pressed tightly against the plastic of the bench in front of me. I pushed my bag further under my seat, leaned my head against the wall and contemplated the day. We had risen early at our hostel in the central part of Cusco. At 2:30 AM, well before the Sun, our alarms went off, our bags were packed, and our boots tied tightly in preparation for the 3 hour bus voyage southwest of Cusco and our ascent to the mountain’s peak. Around 03:30 AM our guide arrived at the front entrance, called out names, and led us to our bus through the, dimly lit, red-clay cobblestone streets of the old capital of the vast Incan empire. While the sun remained dormant and we rode along the relatively straight highway leading out of the city. In that time it was easy to catch some more sleep. But as dawn broke, and we made our way into the mountains, along cliffsides and the endless switchbacks, it became hard to ignore the bumps, and also the beauty of the terrain. The sky was mostly cloudy, but occasionally, the Sun would peek out from behind the coverage, casting shadows over the mountainsides, wholly brindled with the scars of abandoned man-man terraces from the era of the Inkas. The longer we drove, the deeper into the mountains we forged, I felt more and more impressed by the Inkas. If the beautiful power of Machu Picchu, which I visited last week, wasn’t enough, I now had the chance to see the vastness of their agricultural system, one which cultivated more land in Peru than in modernity. I marveled at the ambition of their expansion and the true size of their empire, made even more impressive by their lack of wheeled vehicles, a system of writing, or steel and iron tools. Simply following the winding mountain roads, was enough to convince me that our destination, Vinicunca, should never have been found, let alone on foot. And yet, I soon found myself eating breakfast in a tiny restaurant, in a small village, nestled among Inka ruins, preparing to make our ascent to this mystical place, as herds of alpaca, llama, and sheep grazed peacefully outside. After breakfast, our guide gathered us in a small room with a dirt floor and stacked-stone walled and briefed us on the ascent. We would go 10 km on foot. 5 km up and 5 km down. Over that distance we would increase our altitude by 1,000 m. We would need at least a liter of water and some snacks for the ascent. Javi proceeded to ask about heart problems and lung conditions, and stressed that anyone having difficulty with the trek should hire a horse to take them up to the top. It was around this time that I realized that this attraction, which in Cusco is marketed as a relatively benign day trip, could actually be quite harrowing. At the end of the briefing they passed around a basket of dried coca leaves (the same ones used to make cocaine, and yes, flavor coca-cola). They are a traditional Incan remedy and natural stimulant used to combat the headaches associated with altitude, boost health and energy, and resolve a multitude of other ailments. The leaves are omnipresent here, and ingrained in the culture of Peru. In fact, agricultural workers actually receive them as part of their wages today. The whole leaf and its eighteen alkaloid compounds are not nearly as well studied in western medicine as its illicit derivative, cocaine. And there is little conclusive western evidence for or against the whole leaf’s use in treating altitude. Regardless, in a study published in 2012, 62.8% of travelers departing Cusco reported using some form of coca leaf--in tea, chewing the leaf directly, or in candy-- to prevent altitude related illness, and attempts by Spanish conquerors in the 1500’s to eradicate its use actually resulted in its more widespread popularity. It seems that this tradition probably will not end soon. And that okay. Often it is the little repetitions, like a bowl of leaves in every building, next to every container of hot water, bags of them in every that develop the personality of a place and contribute to an overall sense of culture. I placed a few in a paper wrapper and put it in my pocket for the assent. “Gracias”. After our safety talk, and a second, longer safety talk in Spanish, we reboarded the bus. For the final leg of our time in the bus our convoy was led ominously by a Kia SUV with a light bar that said “rescue” on the side. We pulled into the parking lot that I mentioned before, departed the bus, and began our ascent. I walked slowly from the start, cognizant of the necessity for a slow, calm ascent. About 400 m into the trail, half of our group broke off, concerned about the exertion required to summit. This segment would take a horse to the top, as Javi had suggested before. As we ascended and the partial pressure of oxygen in the air decreased, more and more people climbed into saddles. I, however, had no desire to do this. I have plans to climb Kilimanjaro, which is 600 m taller than Vinicunca, and maybe visit Everest Base Camp, which is the same height as the Rainbow Mountain. I wanted to see if I could handle the pressure (or lack thereof). The higher and higher we climbed, the tinier my footsteps became, to the point that every step was toe to heel. I could feel my heart racing and my respiration increase as my cardiopulmonary system fought to compensate and maintain the oxygenation of my tissues in light of the shortage of oxygen molecules in my lungs. Despite my slow shuffle, my heart pounded as if I were running a marathon, but I felt great. I smiled as I walked, proud of my body for its functionality, thankful for the genes that conferred a quick adaptation to altitude. Soon my breathing and my pace fell into a harmonious rhythm, and I looked up and around at the ruddy cliffs that lined the trail to the mountain. I shuffled slowly around boulders, across bridges, and out of the way of the local guides and horses who comfortably ran up and down the mountain at a light jog. I started to pass other members of our group who had overexerted themselves. Slow. Steady. Purposeful, I made my ascent. As the stripes of the mountain came into view, I tried to think what this must have been like for those who came here first, who deified the mountain, who first set foot on its newly exposed face after its glacial cap melted away. And as I reached its peak, looking down at the striped almost alien terrain, I felt a sort of love and tranquility. I took a seat on the peak, surrounded by other travelers and simultaneously alone. I closed my eyes, felt my heavy breathing of the crisp air, and felt the beating of my heart. I let my tired muscles relax. And as I opened my eyes, I smiled again, knowing that this was real. I was there. And after my experience with the woman that we carried down the mountain, I look back at that time on the summit and think about how lucky I am to have been able to go there, to be healthy enough to make that climb, to go anywhere in the world, to be completely mobile. For these eight months to enjoy a brief respite from the waiting that is so commonplace and to do so at such a young age. I look back at my pictures from my time on Vinicunca, at the surreal landscape, traced perfectly with multicolored lines, like a fairytale landscape from a children’s book. And it reminds me of one such book that those of us in the United States are quite familiar with. I remember chuckling to myself on top of the mountain as I thought of it, “Oh, the places you’ll go.” And now, seven weeks into my travels, I can help but think: Oh, the places I’ve gone. Oh, the places I am. Oh, the places I will be.